Praise, blame and all points in between? Your feedback published in the June 2017 magazine. First I must congratulate you on the stunning success of your leap of faith [our community share offer - Ed]. 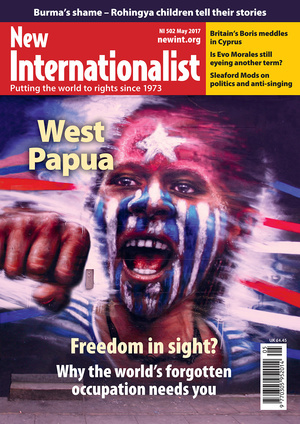 I had a huge disappointment about a year ago – trying to chase down some info/support for West Papua. Always the reaction was the same – glazing of the eyes, and ‘Where’s that?’. Even the city library had nothing. I kind of ran out of steam, but sparked up again on finding, by accident, your April 2002 edition (NI 344). Totally blown away – quality (and bravery of journalism) and depth of report. As far as I can tell it made not a ripple on the sea of apathy. Fifteen years on, I thought – ‘Maybe they can be persuaded to give it another shot.’ After all, the situation is really dire, and a lot of destruction can happen in that time. The Indonesian government has been so effective at covering it up, muzzling/thwarting the Papuans, and conning the world ‘community’. Imagine then my amazement upon seeing ‘next edition West Papua’. I am so thrilled to be a part of it (now I’m an investor!). This really brings home what it’s about. Quality reports on things that matter… that the world neglects. As one of your investors said ‘NI is a national treasure’. If we can bail out banks and all sorts of shady businesses, surely we can protect such valuable resources. Re: your take on the current assault on factual information and informed opinion and the substitution of double-talk for literal definition (Populism rises again, NI 501). I subscribe to the definitions employed by the late Neil Postman, journalism professor at New York University, to describe and explain the pathway to informed opinion. The pathway starts with information, then the distillation; the determination of which elements of information are fact or truth and which are false – the finding of fact, the application of knowledge; an understanding of the factual information, wisdom and experience – the application of context: ethics, values, trust; a reliance on demonstrably trustworthy input and only then, an informed opinion. An uninformed opinion is a prejudice – a pre-judged position, or ‘Don’t confuse me with facts, my mind is made up’. Dinyar Godrej talks about populism (NI 501) and how it is detrimental to democracy or doesn’t talk about the real will of people. In the cuisine called Democracy, populism is just one ingredient, though a major one. But other ingredients like the judiciary, press, public institutions and people’s desire to protect fairness are equally important. He quotes an article on Narendra Modi, but it remains a fact that this gentleman has passed through all the judicial scrutiny and survived a very negative press. How refreshing to read about Canada’s Private Sponsorship of Refugees Programme (‘A personal welcome’, NI 501). Offering people the opportunity to help their fellow human beings directly is a very good thing. After all, it isn’t as if the world has so much compassion it can afford to waste it. One result of the programme that the article doesn’t mention is that it undermines two of the xenophobes’ common objections to refugees: that the government is both foisting them on us and wasting our tax dollars. It’s pretty hard to justify these arguments when the people sponsoring refugees, and paying most of the bills, are your next-door neighbours. I wish that the Canadians were as supportive of their First Nations People, whose land they stole long ago, as they are of the refugees in your article (NI 501). First Nations people are being ignored on the land they were ‘kindly’ given, which is being polluted and poisoned by the exploitation of tar sands by the fossil fuel industry. The coming war on China special edition (NI 498) and John Pilger’s film of the same title are brilliant, important and disturbing. To see how the US has ringed China with its military is truly frightening and a reminder that the US is still the only nation which has used atomic weapons. The current mainstream media and politicians are creating a word storm about North Korea having a nuclear bomb and delivery system. Never mentioned is the information provided by Pilger’s reportage and the fact that the US has 7,000 nuclear weapons, bring upgraded and increased right now; and that Russia has almost as many nuclear bombs as the US. The UK, France, China, Israel, India and Pakistan have barely 1,000 between them. Yet 100 bombs exploded around the world could wipe out humanity. Jeremy Corbyn is both right and a rare voice of sanity when he said his priority would be to work for nuclear disarmament. Under NORAD and other agreements the US can and does use any Canadian forces base whenever it wishes to. Near my home nuclear powered and armed US warships come regularly past Victoria to Nanoose Bay to use a Canadian base to test maritime weapons systems. The cruise missile was tested in Cold Lake, Alberta and US forces fly over Canada and sail in our waters at will. Canada also is one of the three main uranium producers and exporters in the world, along with Australia and Kazakhstan. Thanks for all your excellent work in producing my favourite magazine for 40 years. The New Internationalist welcomes your letters. But please keep them short. They may be edited for purposes of space or clarity. Letters should be sent to letters@newint.org or to your local NI office. Please remember to include a town and country for your address. The views expressed on this letters page are not necessarily those of the New Internationalist.